On October 29, I was just about to start an uphill interval when I had an unsettling realization. My left Achilles tendon had been feeling fine, so I went ahead with the workout, which didn’t seem to do any real damage. But boy was I slow! Ian and Tim repeatedly glided away from me as if I had just given blood. In the long process of regaining fitness, regaining uphill speed has seemed especially hard. Eleven days after the workout noted above, I repeatedly climbed a Ravenna Park hill that, in my heyday, lasted about 83 seconds. Now I needed 95. You know what, though? Training still works. I’ve since done a bunch more hills, supplemented with some stair-stepping at the gym, and I’m getting better. In last Saturday’s Bridle Trails 5-Mile race, I finally shed my 25-year-old pursuer with a surge on the course’s last ascent, about half a mile from the finish. It was, if nothing else, a reasonable sign of progress. Hooray for hills! 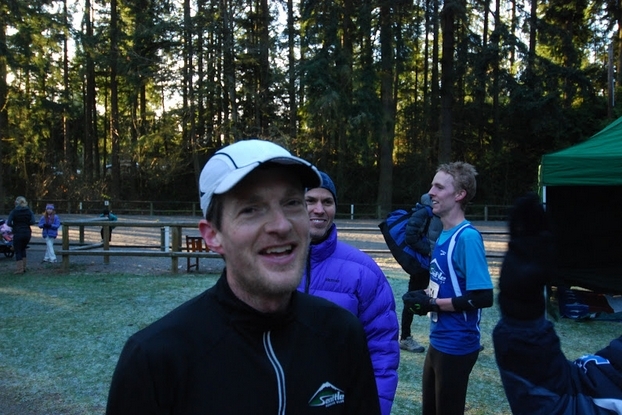 Race volunteer Eric Sach and runner-up Keith Laverty are in the background. Photo taken from Win Van Pelt’s collection. I assume it’s a work in progress and I’m passing judgment too soon? I was too busy to shave last week, that’s all. It is great to see that your comeback is progressing nicely!